Modern day technologies made the pearl smile an affordable luxury for everyone! Unlike the traditional methods of teeth whiting, the cosmetic teeth whining from PEARLSMILE is based on the use of gel that has a total amount of no more than 0.1% peroxide and is activated by the cold LED light. This combination allows to whiten the teeth delicately, without causing any pain. A cosmetic teeth whitening treatment PEARLSMILE® has a lot of followers around the world. The PEARLSMILE teeth whitening gel does not damage the teeth enamel, the cold LED light eliminates dehydration of the tooth denta as well as gum damage. This all makes the PEARLSMILE cosmetic teeth whitening treatment not only painless but also a desirable feature for everyone. The PEARLSMILE treatment is just like any other cosmetic treatment. The length of the treatment may vary from 21 to 45 minutes depending on what kind of result you would like to achieve. You can easily achieve a great white smile in less than an hour. Take a seat and lay back in a remarkably relaxing chair and then enjoy a great smile! TEETH WHITENING UP TO 9 SHADES BRIGHTER! PEARLSMILE® teeth whitening is 100% cosmetic treatment. It does not require any professional dental equipment nor it requires medically trained specialists. It also does not take much space and time, and does not cause any pain during and after the treatment. Therefore we can offer this treatment at a very affordable price for everyone. Purchasing a subscription for a few treatments in advance will allow the client to save even more money. Anyone can get this treatment at an important life occasion wether it would be a wedding, a date, a job interview, a photoshoot or a party. Smile and bring out the smiles from people around you! 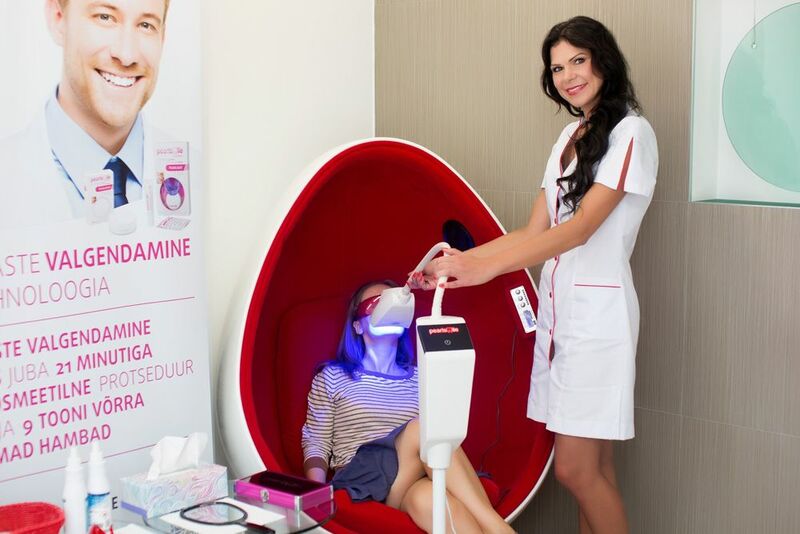 SmileStuudio OÜ is the only specialized Pearlsmile teeth whitening salon in Estonia.